Remember Wild Wild West? I'll understand if you don't. It wasn't fantastic, and hasn't been well-recorded by history. While researching a project I came across something strange involving it - but first, a synopsis. Wild Wild West revolved around a pair of government agents desperate to stop a science villain with a devious plan: Use a bizarre steampunk contraption to attack the joining ceremony of the First Transcontinental Railroad, and then head east, laying waste to the country before finally using it to occupy Washington DC and taking over the country! 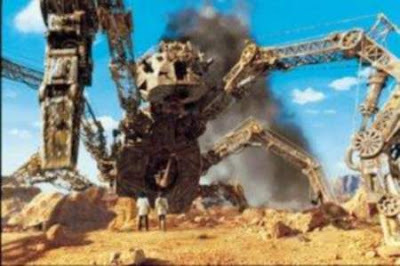 There was more to the plot, of course, with magnetic death blades and flying bicycles, but those are the broad strokes, which I thought it important to lay out before moving onto the program I recently stumbled upon. That show? Batman (the animated series)! 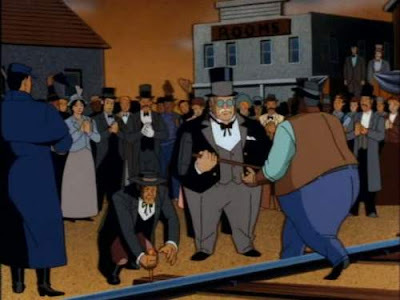 It's the fourth-last episode of the series I happened upon: “Showdown”, which was actually about Jonah Hex, rather than Batman. Which is where things get interesting. The story concerns a science villain with a nefarious plan. To attack the joining ceremony of the First Transcontinental Railroad before heading east to occupy Washington DC and conquer America! 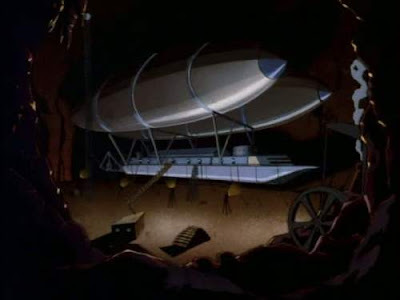 Was the story concept of the Wild Wild West stolen from this random episode of Batman? Obviously I have no evidence, but the lack of any crossover between the four credited writers of the Batman episode and the six whose names appeared on WWW suggests that yes, in fact, this was theft. Whether it was conscious or subconscious is another matter entirely.